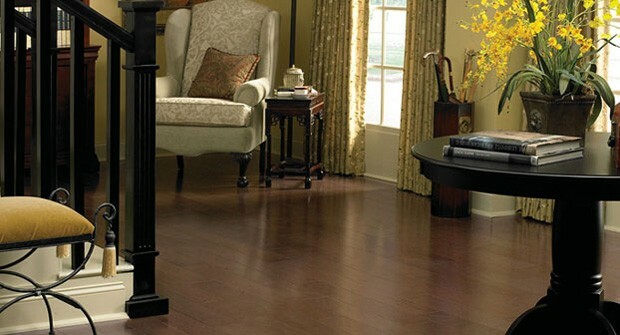 Wood flooring should only be installed on a base area that is dry, clean, smooth, structurally sound and level. Make sure to allow your new flooring to adjust to the humidity lever before you install it, as it can shrink or expand depending on the type and location of the area. First of decide on the direction that the floor will be running, the easiest way is to determine the direction of the floor joists. Generally running the floor perpendicular to the joists is the best method of approach. Starting with the longest wall in the room is the perfect area to begin, but be for you do you need to roll out a 15 pound asphalt-laminated paper underlayment, this will reduce floor noise and protect from humidity. Fasten the underlayment to the subfloor by using a staple gun. Back to the long wall, measure 48 inches toward the center of the room and mark with a pencil. Then snap a chalk line in between the marks that you just made to serve as a guideline for laying the wood as straight as possible. The proper equipment will make the process all the more easy. We suggest you use a power saw that has a fence, like a job or table saw. For crosscuts use a circular saw that has carbide tipped 40 toothed blades. Always cut the boards face down with a circular saw or face up when using a job, table, or miter saw. All end cuts need to be precisely square at a 90 degree angle. You will use two methods when nailing board to a subfloor. We recommend that you use a power nailing for face nailing, and a pneumatic flooring nailer for blind nailing. You can rent these tools from your local home improvement store. When face nailing position the power nailer and pull the trigger. It should shoot the nail below the surface of the wood, after putty the leftover hole with wood putty and wipe off the excess. When blind nailing drive the nail at an angle through the tongue so that when the next board is fitted over the tongue the nail can be hidden. The first three rows of flooring you should choose the straightest boards in the lot, cutting one starter board for each new row. Make sure the boards vary at least 6 inches in link from row to row for a staggered look. Face the tongue of the first row away from the wall and dry fit the boards in place, using ½ inch spacers along the base of the wall. This will help with even expansion gaps in the flooring. Use a tape measure to accurately measure from the guideline to the board’s edge to make sure that it is the same distance at both ends. Once the board is in place, nail it to the subfloor with 1 and ½ inch finishing nails about three inches apart from the board’s ends and about ½ inch from the grooved edge of the board. Do this in 6 inch intervals. Once you reach the end of the row, cut boards to fit. Fit a board from the second row by interlocking its groove tightly with the tongue of the first row. Simply tap it in using a tapping block, it should fit tightly against the first row. Follow up by blind nailing through the tongue, placing a nail every three to four inches from the end of each board, and every eight to ten inches per length of the board. Nail through the floor joists anywhere it is possible. Continue the process until it is almost done. Finally when you reach the last row, you may need to cut the length of the flooring to fit properly. Measure from the wall to the top edge of the last plank installed, not the tongue. Just subtract a ½ inch from clearance and mark the boards to cut them. You may need to use a short pry bar to force the final strip against the last installed plank while you nail it. After all that cut off the excess underlayment and remove any left over spacers that may be sticking up at the edges, install baseboards and shoe molding by nailing to the wall, not the floor. Finish it up with transition strips between other flooring and enjoy.